(TibetanReview.net, Sep09, 2016) – India and Nepal have expressed concern that their ability to plan for flash floods could be hampered by a lack of information from China about glacial lakes and rivers in occupied Tibet. 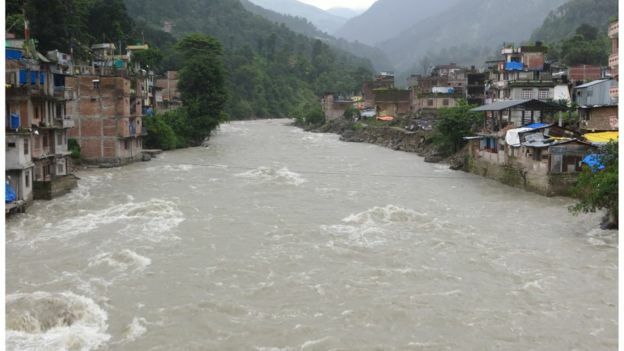 Sources say there has been a rise in avalanches, landslide-dammed rivers bursting, glaciers cracking and glacial lakes dangerously filling up, said a bbc.com report Sep 8. While a recent study has shown Tibet topping the list of places across the globe that has experienced an increase in water, mining and dam construction in the Tibetan plateau had further fuelled concerns in downstream countries, the report added. And in the absence of early warnings from Chinese ruled Tibet, water-related disasters could cause human and property losses downstream in Bhutan, Nepal, India and potentially Bangladesh. In Jul 2016, buildings in Nepalese towns bordering Tibet were swept away by a sudden flood. And authorities in Nepal said it was the result of landslides in Tibet that dammed the Bhotekoshi river. “We were lucky that we could save people because of our own early warning system but timely information from the Tibet side could have helped us save properties as well,” Gokarna Dawadi, chief government official in the district until recently, was quoted as saying. And Bhotekoshi is only one of several rivers that enter Nepal from Tibet. “We have approached the Chinese side a number of times to discuss this issue as we fear future disasters but it has not moved anywhere,” Dawadi was quoted as saying. Officials in India too have been concerned about flooding from Chinese ruled Tibet and their main focus has been on the dams China keeps building on Tibetan rivers. “If waters from them are released in a larger quantity, they may become floods and if we have no storage in the Indian portion, that may create havoc,” Ghanashyam Jha, chairman of the Central Water Commission of India, was quoted as saying. “We have an arrangement for sharing flood information but all the desired information is not available,” Jha was quoted as saying.